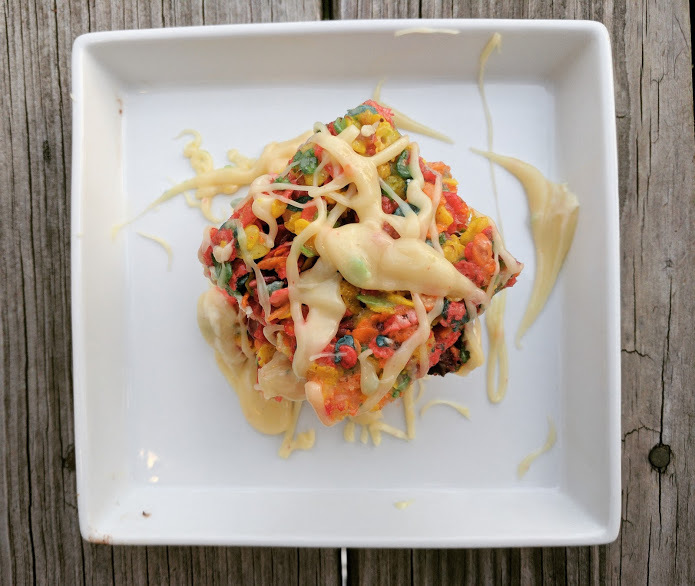 My childhood came through in this recipe, I remember absolutely loving Fruity Pebbles as a kid drenched in milk and then when all the cereal was gone I would drink up the milk. These days I go for more healthy options like Oatmeal or Avocado Toast but every so often I like to remember those sweet, childhood food memories. This recipe while incredibly simple speaks to those memories and made me realize that the original cereals will never get old. It got me thinking that maybe I would like to do a blog food series completely based on all the childhood cereals I used to devour. I had tons of fun making this and it’s totally versatile- whatever you want to top it with, go ahead. Even just plain they are amazing! Get ready for the best sugar high of your life and crank some of these out! Press mixture into the pan- these re not like rice crispies- they need to be refrigerated or put in the freezer to set. Either choice is good, don’t over do it or the treats will be way too sweet. You will be left with delicious, childhood memory inducing treats! I chose white chocolate and it was delicious!